In the opening moments of artistic director Rafael Bonachela’s first full-length work for Sydney Dance Company in six years, a curtain slowly rises to the loud and deeply resonant sound of a string being plucked – maybe on a cello or maybe a double bass, which reverberates throughout the theatre. It’s amplified to the point that your seat vibrates slightly before the curtain reveals an ensemble of dancers – some alone and others in small groups – scattered around the stage. Bonachela has arranged these disconnected but congruent images in a painterly fashion, using the full depth and breadth of the stage. (In fact, there’s something about the use of space that in this first section feels a little like Salvador Dalí’s ‘The Persistence of Memory’.) Like much of this work, which was developed through improvisation with the full ensemble of 16 dancers, there’s a fascinating tension between the highly ordered and disciplined world of Bonachela’s staging and the messy, chaotic and extraordinarily potent humanity of the dancers. The title of the piece, ab [intra], refers to the Latin phrase meaning “from within”. Bonachela’s mission in creating the work was to find an expression of our internal lives in an external, physical language. 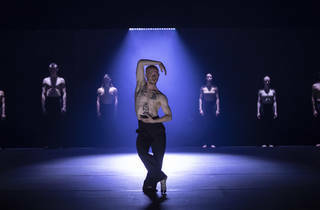 You could say that’s what most contemporary dance is really about, but there’s a directness to his approach and what his committed and generous dancers offer. At the start of the show, long horizontal bars hang above the stage, through which lighting is projected. We see the shadow of those bars dissecting the stage below, like strings up and down the neck of a violin – or the black lines of a stave in musical notation. The score is by Sydney composer Nick Wales using elements of a cello concerto by Latvian composer Pēteris Vasks, and as it intensifies, those bars fly out of the space, one by one, leaving the dancers on a bare white stage against a black wall. The collaboration between Wales and Bonachela is arguably the greatest strength of this work – as Wales seems to be exploring the emotional and physical extremes that can be wrenched out of string instruments (with some electronic enhancements and loud amplification throughout the various movements), Bonachela is right there by his side exploring the emotional and physical extremes that his dancers can reach. Bonachela is equally at home choreographing for the full ensemble as he is for solo and duet works, and he shows a broad range of choreographic style: some sections are characterised by tightly wound and quickly evolving movement, whereas others are all extended limbs soaring across the space. Some of the ensemble segments can feel like a bit of a tease – most are over before they’ve had the chance to truly settle in – but there’s a touch of showmanship in this choice and an intelligence to the structure, which repeats certain choreographic phrases to great effect. As is usually the case in Sydney Dance Company productions, the dancers’ individuality is at the forefront and each is given a moment to shine. There are standout duets by Izzac Carroll and Janessa Dufty, as well as Charmene Yap and Davide Di Giovanni, who have an astonishing physical and dramatic connection to one another. 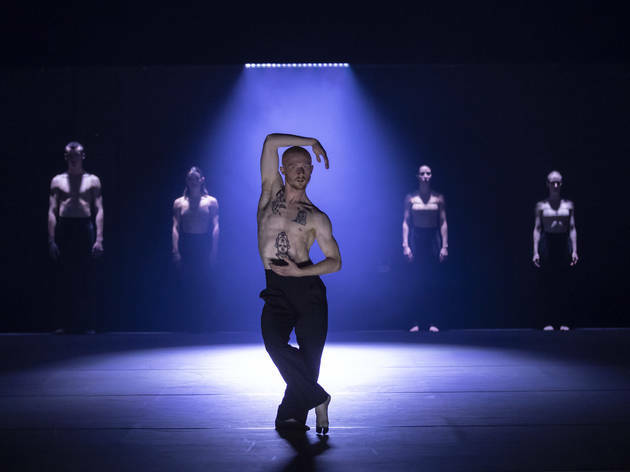 Nelson Earl, who is quickly becoming one of the company’s favourite dancers, has a solo that begins in an ordered and calm fashion before devolving into a wrenching scream. This is contemporary dance at its most evocative and beautiful, but it defies easy analysis and refuses to offer up straight-forward answers. What it has in spades is moments of sheer wonderment and unexpected emotional catharsis. In its final minutes there’s a dark and disturbing, but undeniably beautiful image. It sneaks up on you before holding you in a moment of extraordinary tension. Once the tension is broken, Bonachela turns towards the light – after all that’s gone before, the work ends on a surprisingly uplifting note. This is a review of the Sydney premiere season of ab [intra].